Denmark is a popular tourist town which has a relaxed village atmosphere, romantic timber milling history and incredible coastal scenery. Just 45 minutes drive west of Albany on the southern coast, Denmark stands on the shores of the spectacular Wilson Inlet and boasts glorious swimming, surfing and fishing beaches. There’s plenty of attractions in town with the historic fire station, old butter factory, Denmark’s first school, and the popular drinking hole the Denmark Hotel. If you have difficulty choosing just what you want from Denmark’s wide range of accommodation, call in to the Visitor Centre, where you can add your comments to the Bibbulmun Track Register and have a chat with the experienced staff. They also have loads of information about attractions, events and activities for you to enjoy. 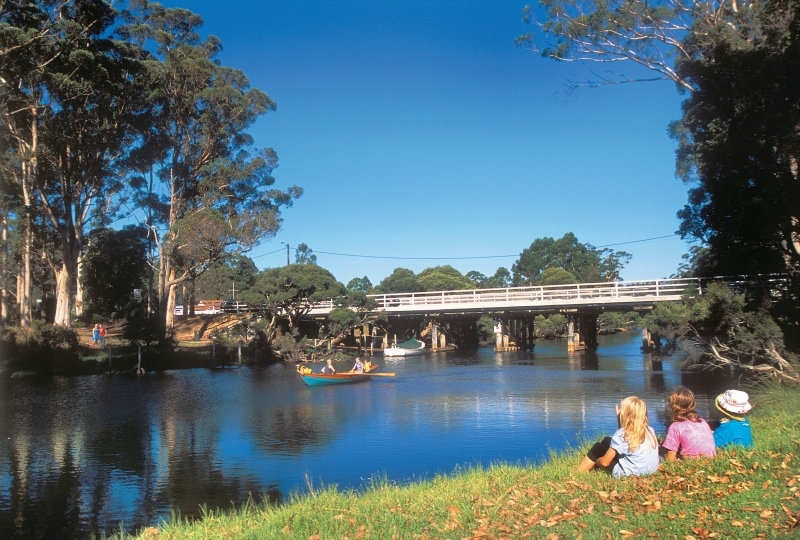 Explore the town’s maze, alpaca stud, animal farm and sandalwood factory or take a whale watching tour. A pleasant day on the river. Water lovers can hire canoes, motorboats, paddleboats or aqua bikes and mess around on the river. Throw in a line for herring, salmon and bream at Lights Beach or just kick back and watch the waves crashing over the rocks at Wilson Head and Lions Lookout. The town of Denmark was established in 1884 to service the timber industry. It was named after Dr Alexander Denmark, a naval physician and friend of Dr Thomas Wilson, who discovered the Wilson Inlet. Sadly, when the magnificent karri began to run out many people left, leaving only a few settlers to struggle through the ill fated Group Settlement Scheme and the depression of the 1930’s. However, Denmark survived, and now is a popular tourist destination. Popular scenic drives around Denmark include the Scotsdale Tourist Drive and the Mount Shadforth Scenic Drive. These offer changing vistas of pastured farmland, forest and ocean, with distant views of the Porongurups and Stirling Ranges. Albany is a 60km drive east of Denmark which takes approximately 45 minutes along the South Coast Highway. The walk between Denmark and Albany (83.5km) usually takes five days. 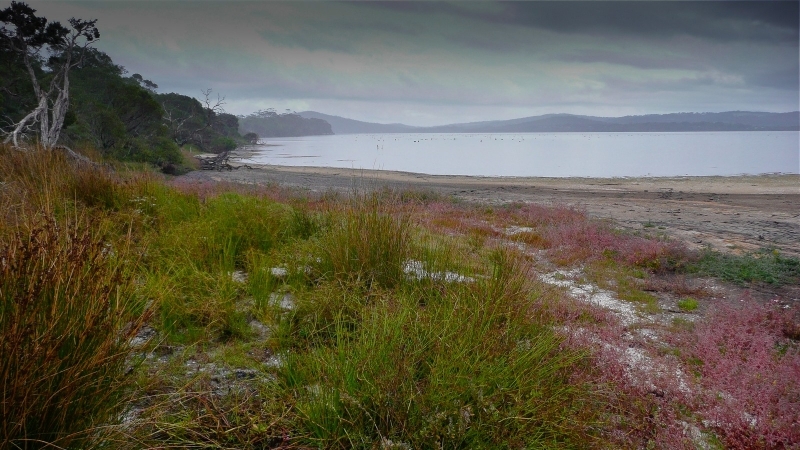 Peaceful Bay is 41km west of Denmark - a 30 minute drive along the South Coast Highway and Peaceful Bay Road. The walk between Denmark and Peaceful Bay (65.2km) usually takes three days. For travel details to Denmark view the Section by Section guide. Denmark has a large range of accommodation, from a caravan park to backpackers, motel/hotels, self-contained units and B&Bs, to luxury resorts. It also has supermarkets, general stores, a laundry, a pharmacy, Internet access, cafés and several restaurants. A small range of camping gear, including camping fuel, is available from the local hardware store. Denmark has a taxi service, and a few local transport operators will transfer walkers to the Track in the Denmark area. Please support our Walker Friendly Businesses.